The Prince George Cougars are in the market for an assistant coach, general manager Todd Harkins confirmed to Taking Note on Sunday. They have a vacancy after Michael Hengen left the team after two seasons. . . . "We have had quite a few resumes come in and are slowly sifting through them,” Harkins said. . . . A new assistant coach will work alongside head coach Richard Matvichuk and associate coach Steve O’Rourke, both of whom are starting their first seasons with the Cougars. . . . As for Hengen, he told Taking Note that he has “decided to move on from coaching.” It was, he added, “an absolute dream come true to coach in the WHL.” He had to make a “tough decision,” he continued, “but it’s a very necessary choice that I had to make.” . . . Brent Arsenault, who had been with the organization since 2005 and also was the education advisor, has left the Cougars, too. Harkins said that the Cougars have added Mary LaMarre as the education advisor. She “was Brent’s contact and right-hand person at Prince George Secondary School,” Harkins said. With two of the WHL’s Big Three having left for the NHL over the past month, what about the one who remains? Bruce Hamilton, the majority owner, president and governor of the Kelowna Rockets, told Larry Fisher of the Kelowna Rockets: “I’m 59 and I’m not so sure that’s in line for me right now. I’m happy here right now. We want to win again — that’s the most important thing for us, and to continue to have one of the better franchises in the Canadian Hockey League.” . . . Kelly McCrimmon, the owner of the Brandon Wheat Kings, has signed on with the NHL’s Las Vegas expansion franchise as assistant general manager. Tim Speltz, the long-time general manager of the Spokane Chiefs, is leaving to join the Toronto Maple Leafs as a western scout. . . . Hamilton? Well, he added: “If the right thing came along that interested me, yeah, I would listen. You’d be stupid not to listen.” . . . Fisher’s story is right here. The Everett Silvertips are being ‘Trumped’ on Tuesday. . . . Donald Trump, the Republican presidential candidate, has Everett’s Xfinity Arena booked for the entire day, so the Silvertips will be on the outside looking in. Unless, of course, they plan on attending The Donald’s rally, which begins at 7 p.m., although the doors apparently open at 4. . . . The Silvertips wrapped up their main camp with the annual Green vs. Grey intrasquad game on Sunday afternoon. The Saskatoon Blades have signed F Brady Nicholas, who was a fifth-round selection in the 2016 bantam draft. From St. Albert, Alta., the 6-foot-0, 178-pound Nichols had 43 points, 14 of them goals, in 30 games with the bantam AAA St. Albert Saints last season. The Moose Jaw Warriors announced the signings of four players, each of them taller than 6-foot-0, following their intrasquad game on Sunday night. . . . D Matthew Benson of Surrey, B.C., played last season with the Delta Hockey Academy Elite 15s. The 6-foot-1, 187-pound Benson recorded one goal and 12 assists in 33 games. He will turn 16 on Nov. 24. . . . D Matthew Sanders of Calgary was a fifth-round selection in the 2016 bantam draft. Sanders, 6-foot-2 and 191 pounds, played last season with the bantam AAA Calgary Bisons, scoring seven goals and adding 10 assists in 36 games. . . . F Kale Clouston, 6-foot-4 and 177 pounds, is from Rockyview, Alta. He was a fifth-round pick in the 2015 bantam draft. Last season, with the minor midget AAA Rockeyview Raiders, he had 39 points, including 14 goals, in 62 games. . . . F Brecon Wood of Edmonton also signed. The 6-foot-2, 168-pounder was selected in the seventh round of the 2015 bantam draft. He will turn 16 on Dec. 5. Last season, he had 15 points, four of them goals, in 23 games with the OHA-Edmonton team in the Canadian Sports School Hockey League. When the Moose Jaw Warriors held their intrasquad game on Sunday night, admission was by donation with all proceeds going to the Canadian Mental Health Association in memory of Ethan Williams. . . . It is important that people like Williams not be forgotten. . . . Two years ago, Williams, a Warriors prospect from Winnipeg, took his own life at 16 years of age. . . . Mike McIntyre of the Winnipeg Free Press explored Williams’ story right here. By now you will be aware of the thief in goaltending gear who hit a beer store in Russell, Man., the other night. All of the publicity this thief has received reminded me of a gem of a book that I don’t think received its proper due when it was published in 2005. 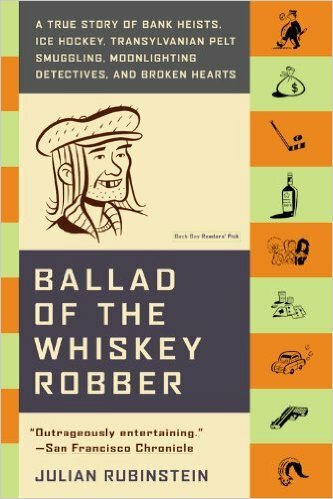 The book, by Julian Rubinstein, carries the title Ballad of the Whiskey Robber: A True Story of Bank Heists, Ice Hockey, Transylvanian Pelt Smuggling, Moonlighting Detectives, and Broken Hearts. . . . Seriously, that is the title. . . . It is the story of Attila Ambrus, who moonlighted as a gentleman thief while trying to carve out a career as a professional goaltender in Budapest. . . . This is a truly bizarre story and a worthwhile read, one that will leave you shaking your head in disbelief. Got a tip or some information you feel could be useful to me, feel free to email me at greggdrinnan@gmail.com.